Misiones is a department located in the southern region of Paraguay. Its capital is San Juan Bautista. 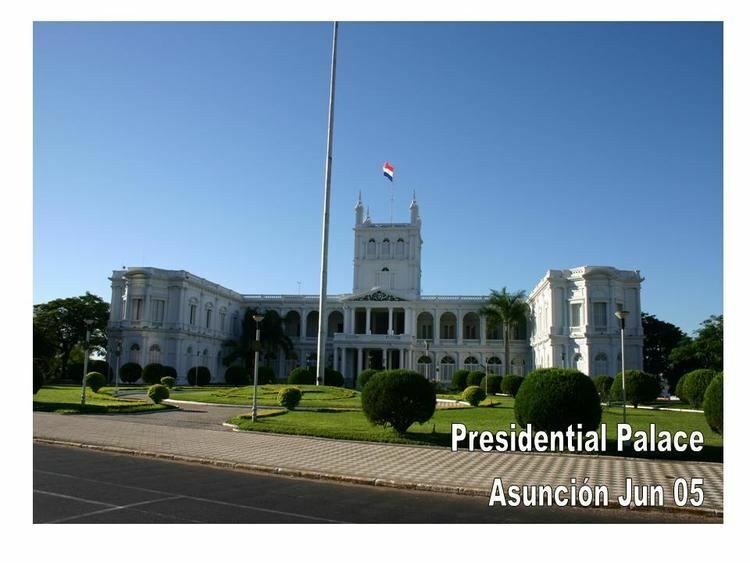 The eighth of Paraguays 17 departments, it was created in 1906, then known as the San Ignacio Department, and was not given its present name until 1945. 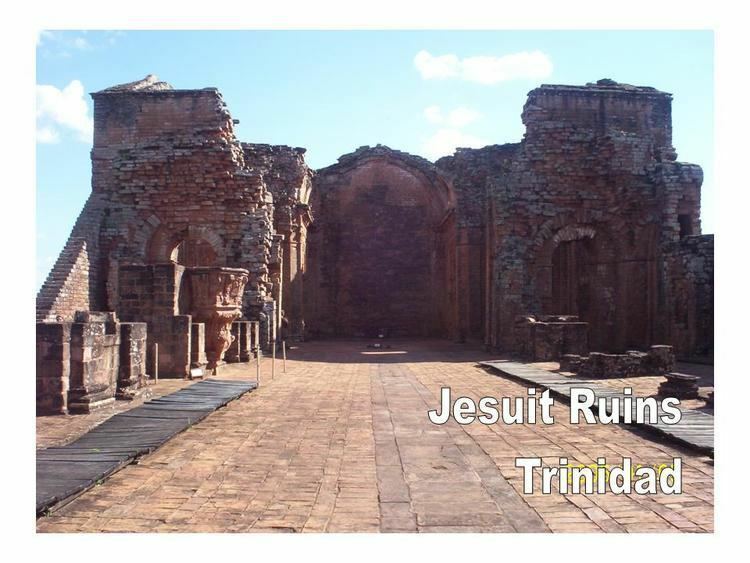 Its current name reflects its status as home to several Jesuit Reductions, or missions. Misiones borders the departments of Paraguari and Caazapa to the north, Itapua to the east, Neembucu to the west, and the Corrientes Province of Argentina to the south. The modern settling of Misiones began with the arrival of Jesuit missionaries to the region in the 17th century and the subsequent establishment of several reductions whose purpose was to both civilize and catechize the indigenous Guarani peoples. While several of these reductions would ultimately be in Argentinian and Brazilian territory, 8 of the reductions would remain in Paraguay, concentrated in what would become the Misiones and Itapua departments. Some of these reductions, namely San Ignacio Guazu, Santa Maria de Fe and Santiago would become the foundation for subsequent towns in Misiones. The town of Yabebyry was established in 1790, and later, during the presidency of Carlos Antonio Lopez, the towns of San Miguel and San Juan Bautista were founded. 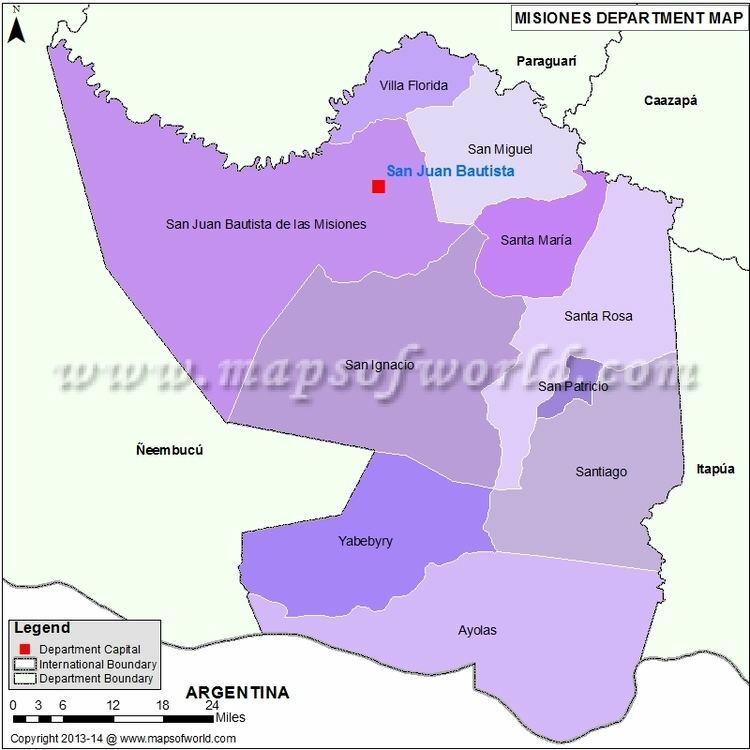 When the Misiones department was created in 1906 as the San Ignacio department, these towns were made several of the departments first 8 districts, along with Santa Rosa, Ayolas and Villa Florida. When the department was renamed in 1945, its capital was moved from San Ignacio to San Juan Bautista. Misiones department is relatively flat and crossed by a number of rivers and streams. The northern and southern borders of the department are formed by, respectively, the Tebicuary and the Parana rivers, the latter of which is an important waterway in the region. A number of other streams cross the department, including the Yabebyry, Atingui, San Roque, Sauce, Uruguay, Caa Poi, Tororo, San Tadeo, San Antonio and Itay. The basic economical activity of this department is the cattle breeding. This is the main production . Also they have pigs, sheep, horses and goats, this one is the least. Regarding the agriculture, the fields are mainly in the north and center of the department. In its lands they can grow rice, soya, corn, sweet oranges, sugar cane, sweet potatoes, cotton and potatoes. Its main attractions are the beaches formed by the rivers Parana and Tebicuary. Villa Florida is a city which offers landscapes to its visitors. This department is known by the work of evangelizing by the Jesuits priests who founded the place with many reductions. A few towns still have the remains of that era such as the colonial churches. Part of the historical remains is exposed in Museums with many samples of wooden carvings made by the Indians at the reductions period.